I’m not above reading the occasional self-help book, but they usually don’t do me much good. The problem is that I never remember any of the advice after I’ve read the book. What good is a self-help book if I forget everything after I’ve read it? It’s okay if I forget everything in a novel because that means I can read it again a few years later and be entertained. But a self-help book is worthless if I can’t remember the advice. That’s why I stick with How To Win Friends & Influence People by Dale Carnegie. If I’m going to forget self-help advice, I want to forget the best! If the cover says it’s “the only book you need to lead you to success,” that’s good enough for me! 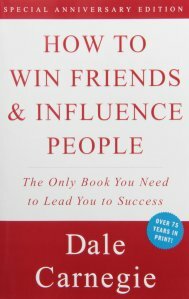 Just so you know, I didn’t decide to read How to Win Friends and Influence People by Dale Carnegie because I needed some self-help. Well, I might need help, but if I ever read a self-help book because I actually need help, I’m not going to admit that to anybody. When I was a kid in the 1970s, the big self-help book was called I’m Okay-You’re Okay. That title rubbed me the wrong way because it implied that everybody was okay and even then I knew a lot of people who weren’t okay. I wasn’t even sure I was okay. Maybe the author and I disagree about what “okay” means. I’ve never read the book to find out. Sometimes I think I’m better off if my opinion is uninformed. How to… is much more practical than any self help book, about how to relate to people and achieve what you want, written by one of the greatest capitalists ever who knew what he was talking about. Self help books are empty calories. I had no idea HTWFAIP was so old. I’ve never read it, but I think it’s probably no longer relevant, if it ever really was — I’m sure that, even in the 1930s, a high percentage of people already knew that being a good listener would make them better at conversation. My observation has always been that many people like to read self-help books so they can feel that they’re doing something to improve themselves without having to do anything. It’s like reading lots of ‘How to Lose Weight’ books but never eating better food or getting more exercise. To be fair, though, some self-help books are outright harmful (The Secret comes to mind. Talk about convincing the victim to blame themself! ‘What you think about is what you attract to your life, so if you take precautions to avoid getting mugged while walking alone after dark, you’re asking to get mugged.’), so not following their “advice” is for the best. A lot of people don’t know how to relate to people and much less how to influence them in order to achieve anything. Maybe knowing that someone did things a different way can help? Not walking alone in the dark is just common sense, depending on wfere you are. Who needs to read a book about that? I’ve never read one that actually helped either. I always wonder more about the people who say it helped though. 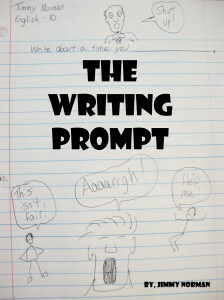 « I Wrote A Letter To My Teenage Self, And He Smarted Off At Me!